If there’s Christmas in July, why not Thanksgiving in June? 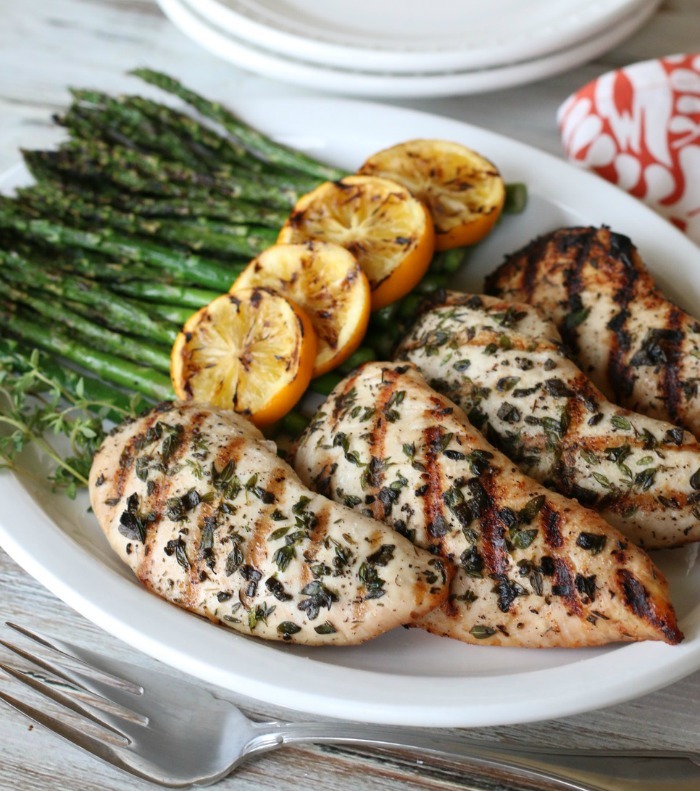 One of my boys’ favorites, these Easy Grilled Herb Turkey Breasts let you enjoy the savory flavors of Thanksgiving anytime – without all the fuss! 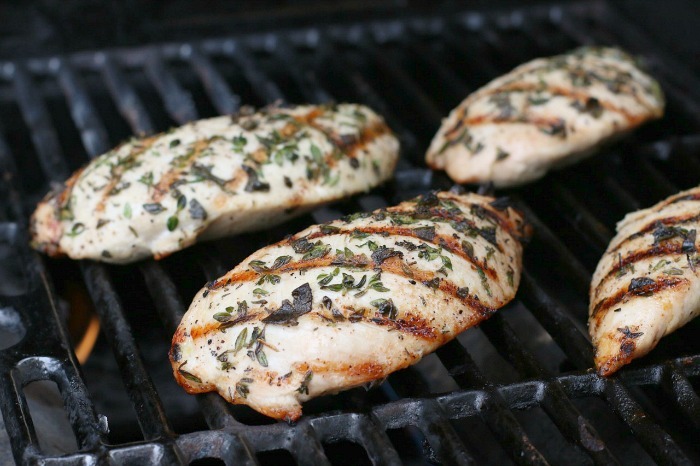 That’s because you simply toss these flavorful turkey breasts right onto the grill along with your favorite veggie. And in less than 10 minutes, you’ve got an easy and nutritious meal everyone will be thankful to enjoy! And whether you’re a novice, or veteran griller, be sure to check out my Top 10 Best Grilling Tips for some secrets of success that are certain to take all of your grilled foods to a whole new level of excellence! 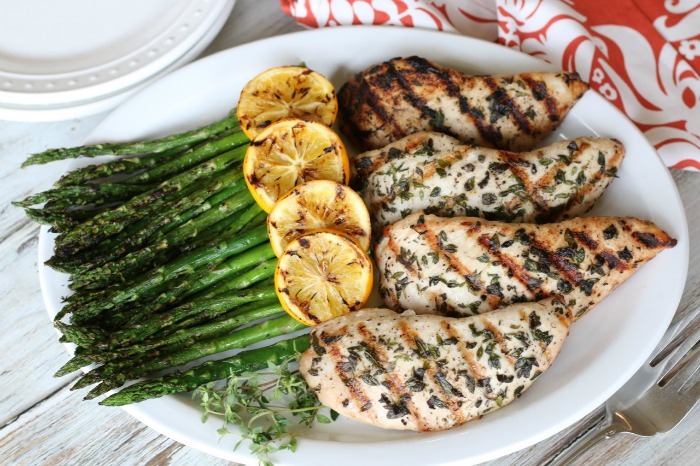 With bright and beautiful asparagus still in season, it’s a real summer treat to serve these flavorful turkey breasts with a simple side of grilled asparagus seasoned with just a little avocado oil, sea salt and fresh ground pepper. Grilling a few lemon slices also adds a beautiful touch, as well as a burst of tangy flavor when you give them a little squeeze over the warm asparagus. Simply delicious! Place turkey breasts side by side in a large plate or baking dish. In a small bowl, whisk together the olive oil, sage, thyme, salt, pepper and garlic powder. Pour over turkey. Heat grill on high heat. When grill reaches 400 degrees, add turkey and cook about 3-4 minutes, then flip and cook another 2-3 minutes, until instant-read meat thermometer registers 160°F degrees. Transfer to a platter and cover; allow meat to rest 5-10 minutes before serving. Enjoy! Save time and enhance flavor with a simple shortcut to juicy roast chicken with just a few snips of your kitchen shears! Learning to butterfly (a.k.a. spatchcock) a whole chicken is an easy, foolproof technique for ensuring an evenly cooked, juicer bird. To butterfly a chicken means to remove the chicken’s backbone and lay it out flat like a butterfly. This simple technique is easily accomplished with a simple pair of kitchen shears . The result is … perfectly roasted chicken that’s juicer, crisper and done 15 minutes faster than a traditional whole roasted chicken! That’s because flattening the chicken exposes more surface area to heat, which reduces overall cooking time, and also results in the white breast meat and dark leg meat reaching doneness at the same time. And even cooking means juicer meat and a crisper skin! 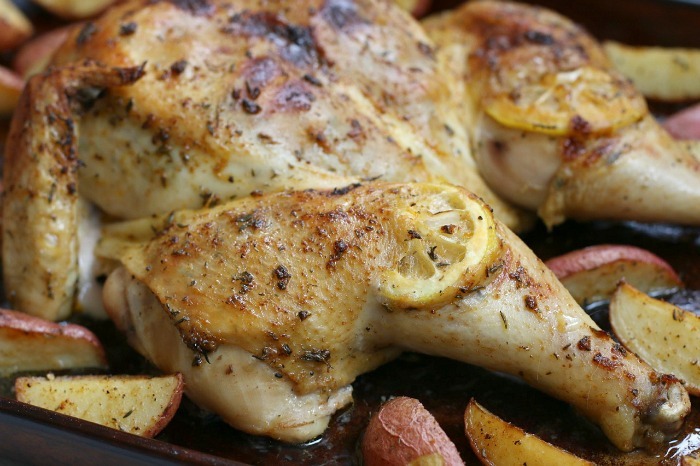 Another plus is that roasting a whole chicken saves money, since whole chickens cost less per pound than cut-up chicken. And of course, you’ll have chicken bones leftover, which can be used to make delicious homemade chicken stock. Making your own bone broth not only saves money, but results in a far healthier and flavorful stock than store-bought varieties. This beautiful classic dish is as delicious as it is stunning! 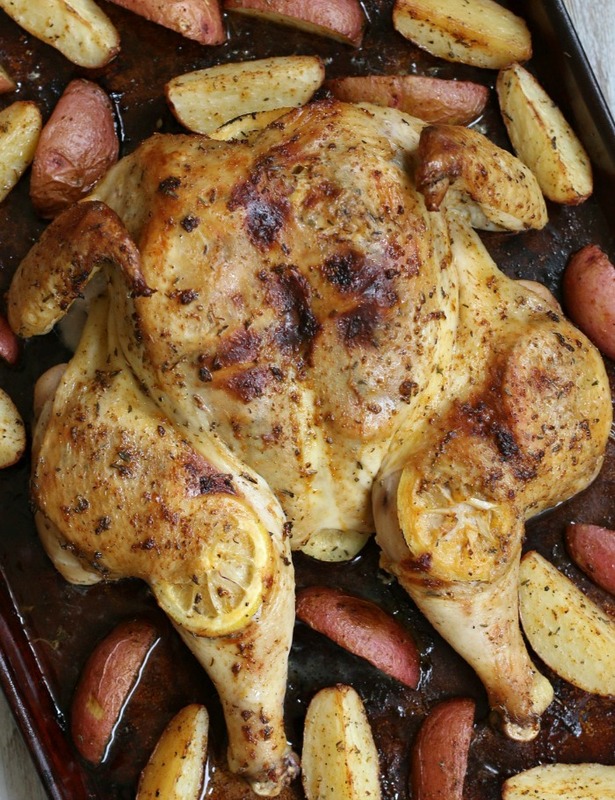 With it’s rich savory seasonings and bright burst of tangy lemon flavor, your family will never know this savory Roasted Lemon Spatchcock Chicken takes just minutes to prepare! Step One: Rinse and pat dry one whole chicken (about 3-4 pounds). 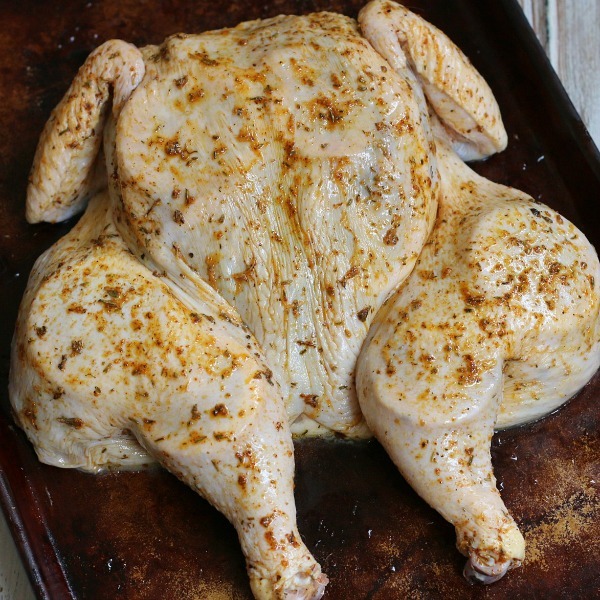 Place the chicken breast side down on a work surface with the legs facing you. Grab a sharp pair of heavy duty kitchen shears . Step Two: Grab the bird by the tail. Using sharp kitchen shears , carefully cut along the right of the backbone from the tail to the neck. Step Three: Turn the bird with the legs facing away from you. With a firm grip on the neck, carefully cut out the backbone. (If you’re right handed, turning the chicken is easier and safer, because it allows you to keep a firm grip on the bird without having to cross over your left hand to cut.) Be sure to save the backbone for making delicious and healthy homemade chicken stock. Step Four: Flip chicken over and open it up like book, laying it flat on a work surface. Use the palms of your hands to firmly press down on the breastbone to flatten the chicken. Congratulations! You’ve just butterflied (spatchcocked) a chicken! Now we’re ready to dress our beautiful bird! Starting at the top with the neck, slide your fingers under the skin and gently separate the skin from the breast meat. Then, move to the bottom tail area to continue loosening the skin from the breast meat. Finally, move to each side of the bird, and run your fingers under the skin to separate the skin from the thigh meat. 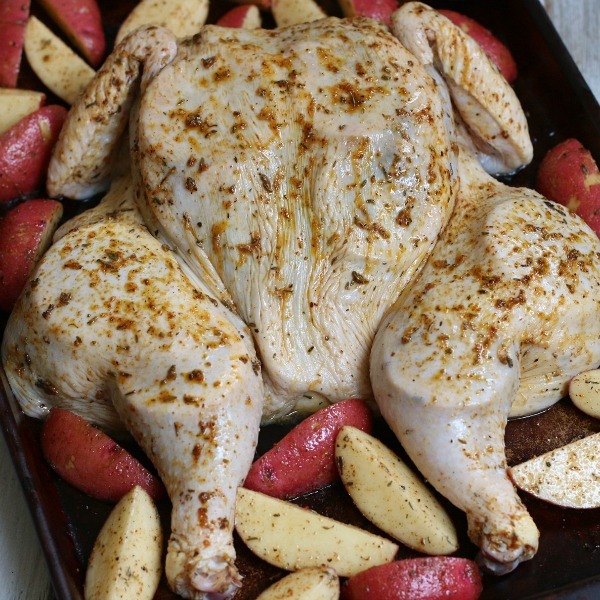 Now that our bird is dressed and ready to go, let’s toss some seasoned baby potatoes onto the baking sheet for the perfect one pan meal! 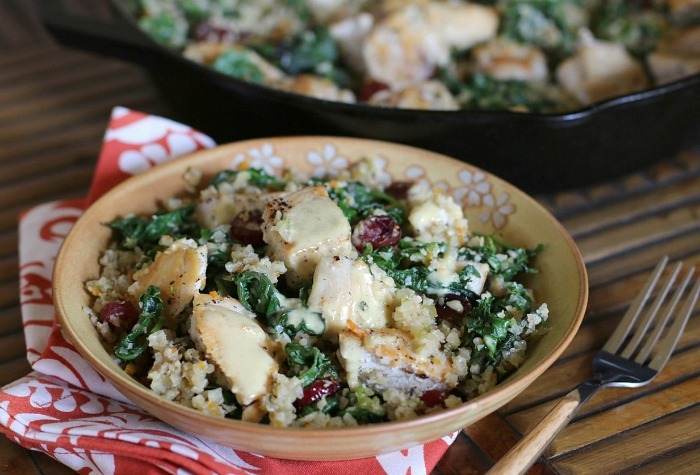 Succulent and savory, this quick-n-easy Roasted Lemon Spatchcocked Chicken is bursting with flavor! This bird is so delicious, planning for leftovers can be a challenge (did I mention I have two teen boys). A great solution is to roast a larger bird, or two small ones at the same time. That way, there’s extra meat on hand for creating quick-n-tasty meals, such as savory soups and salads. P.S. Remember to save the bones for making delicious and healthy homemade chicken stock. Preheat oven to 450°F. Rinse and pat dry chicken. 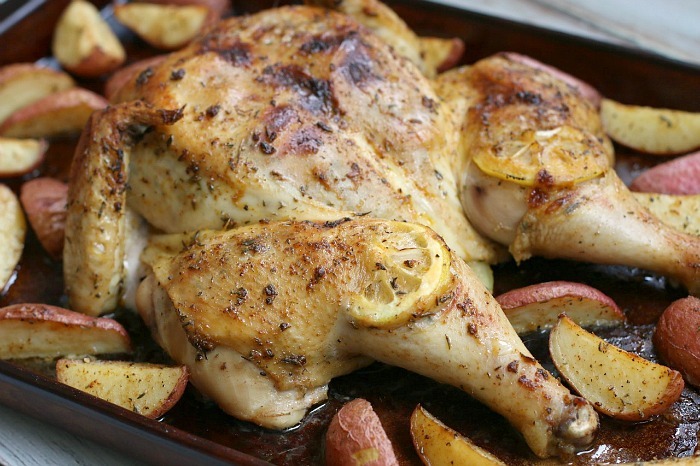 Place chicken breast side down on a large rimmed baking sheet. To Butterfly the Chicken: Grab the bird by the tail. Using sharp kitchen shears, carefully cut along the right of the backbone from the tail to the neck. 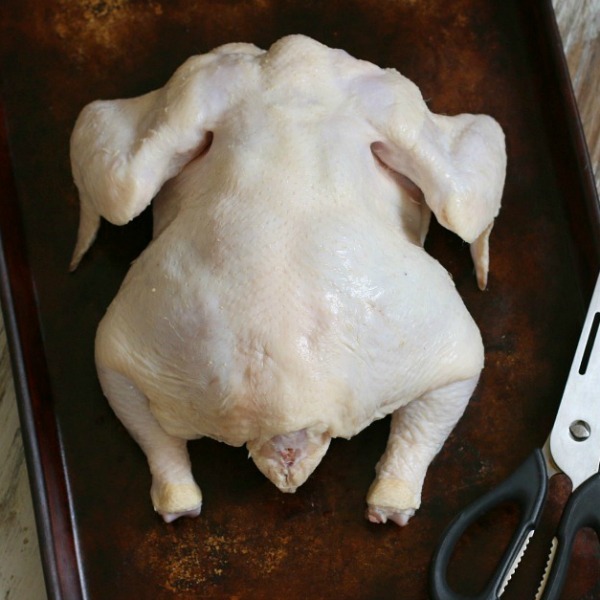 Flip chicken over and open it up like book, laying it flat on a work surface. Use the palms of your hands to firmly press down on the breastbone to flatten the chicken. For the Seasoning Rub: In a small bowl, add all of the seasonings and mix well to combine. Add the oil and stir well to form a loose paste. For the Baby Potatoes: Using a kitchen towel, dry the quartered potatoes. Then place in a gallon-size baggie with one teaspoon of the seasoning rub. Seal and shake the bag to thoroughly coat the potatoes; set aside. To Season the Chicken: Use your fingers to gently separate the skin of the chicken from the breast and thigh meat to create pockets. Rub half of the flavorful seasoning paste under the skin, covering the breast and thigh meat. Next, rub the remaining paste all over the skin. Then, slide the lemon slices under the skin in a single layer. 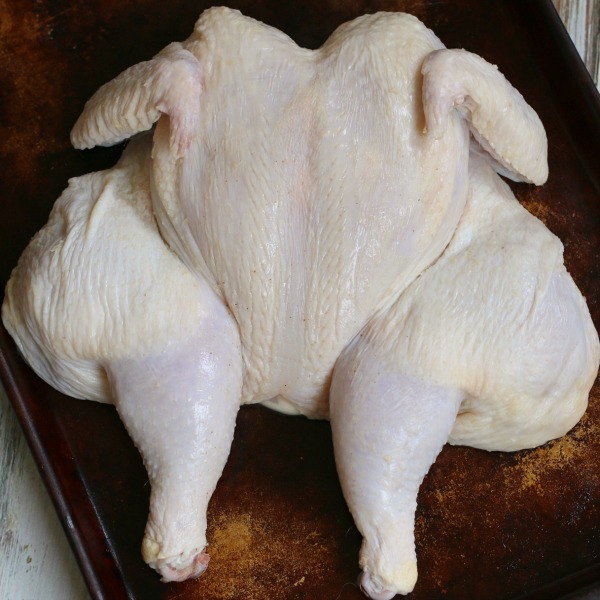 Roast chicken until skin is crisp and an instant-read thermometer inserted into the thickest part of the breast registers 160°F to 165°F, and 170°F or higher in the joint between the thigh and the drumstick (about 35-40 minutes). Let chicken rest for 10 minutes before serving. Enjoy! The last day of school officially marks the start of summer in our home! And anytime there is something to celebrate, the boys always ask me to make Thanksgiving dinner. I’m not kidding! It’s their favorite meal – ever! 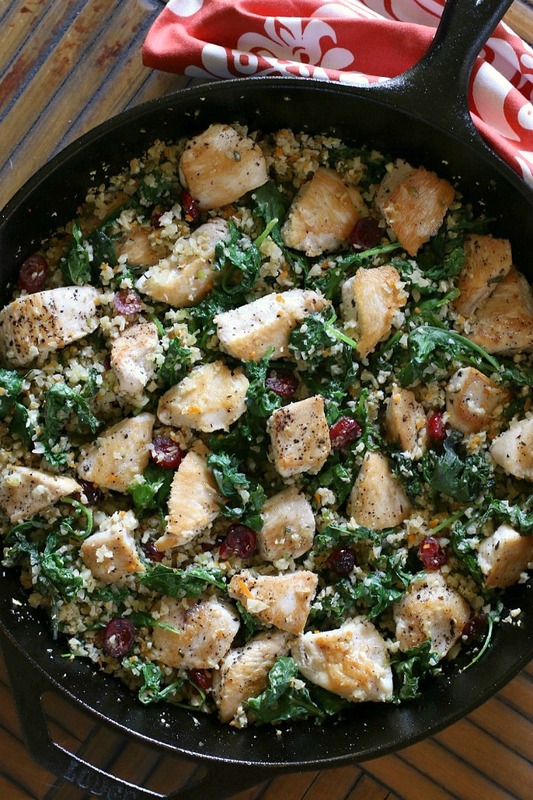 Instead, I put together this amazing one-skillet savory chicken dish! With just a hint of Thanksgiving flavor, and drizzled with a slightly sweet apple cider mustard sauce, this easy-to-make meal is bursting with satisfying fresh flavors. I made this delicious dish using pastured chicken, because I had it on hand from my recent ButcherBox order. Of course, its equally scrumptious with boneless, skinless turkey breasts. Whether you’re celebrating the end of the school year or not, enjoying quick, healthy meals that satisfy kids of all ages is always a win-win! 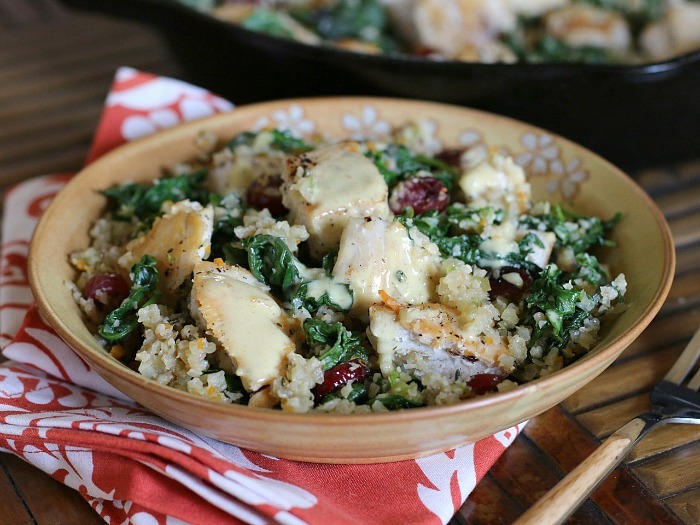 This simple, one-skillet savory chicken and veggies dish takes just minutes to make and is packed with flavorful sautéed chicken and good-for-you greens topped with a drizzle of my special no-honey mustard dressing. Yum! For the No-Honey Mustard Dressing: Whisk ingredients together until well blended. Place in mason jar and refrigerate for up to one week. 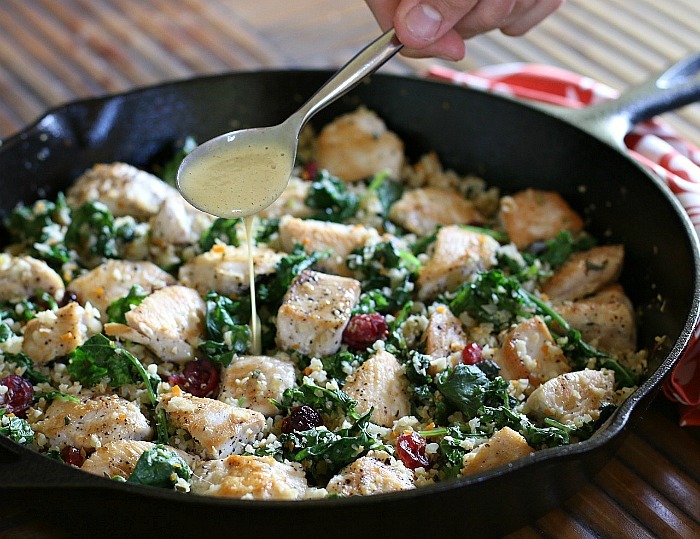 For the Chicken & Veggies Skillet: Cut chicken into one-inch cubes and place in a medium bowl. Season with sea salt and fresh ground black pepper. Toss well to coat. In a large 12" cast iron skillet or sauté pan over medium-high heat, add 2 teaspoons of avocado oil. Evenly distribute half of the cubed chicken in the hot skillet. Sear chicken until it releases from the pan (about 2 minutes). Flip and cook about 1-2 more minutes. Transfer cooked chicken to a plate. Repeat process with remaining chicken. Set plate of cook chicken aside. Reduce heat to medium, add an additional 2 teaspoons of avocado oil to the skillet. Add the fine diced onion and carrot. Cook and stir for a minute to release brown bits from bottom of the skillet. Then add the grated cauliflower, dried cherries (or cranberries) and seasonings. Continue stirring and sautéing the cauli-rice mixture until well combined (about 1 minute). Then add the baby kale and apple juice. Cover the skillet and allow the baby kale to steam for about 2 minutes. Remove cover and stir to combine. Continue cooking and stirring until the kale is wilted (about 2 minutes). Add the cooked chicken and its juices to the skillet, continue cooking and stirring until chicken is rewarmed and cauli-rice reaches desired texture (about 1-2 minutes). Remove skillet from heat. Drizzle with "no-honey mustard sauce." Divide among 4 bowls and serve with additional mustard sauce. Yum!